Possibly the most popular and heavily used trail in the wilderness. The lake is large and contains fish. This trail is a popular route into the backcountry. From the trailhead, head a few hundred yards north to the Falls Fork of Rock Creek. Look for strawberries on the first stretch in July. Cross the creek on the sturdy bridge and follow the creek. There is a pretty waterfall not too far in. The trail climbs above the creek and you soon reach the junction with the Edith Lake trail. Continue south toward Johnson Lake. You’ll be walking through a recently burned area (2005?) all the way to the lake. 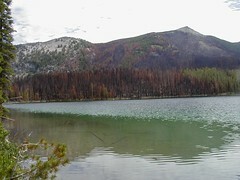 Johnson Lake is one of the lower and larger in the wilderness. Campsites are at the south (far) end of the lake. From here you can head west to Phyllis Lake, south over Pintler Pass to Oreamnos Lake, or east to Rainbow Lake. This is an easy overnight for beginning backpackers, but you won’t have it to yourself unless you go off season.